Many Magento website owners want to let their shoppers upload files or bind images directly into the product detail page, or upload different images into different products before "add to cart". Magento Order Upload extension is often used on printing company websites which allows clients to upload images or their designs if they want to place orders for printing services. This extension is a web-to-print solution built in Magento platform. After uploading files/ images, shoppers can add this product into their cart. So a shopper can upload different files/ images into different products and add all into cart and check out the same times. Uploaded file will display on the shopping cart page, into the Magento order of client account. Set the width and height of the flash upload window. Many Magento website owners want to let their shoppers upload files or bind images directly into the product detail page, or upload different images into different products before they click "add to cart" button. Magento Order Upload extension is often used for printing company websites and it allows clients to upload images or their designs if they want to place orders for printing services. 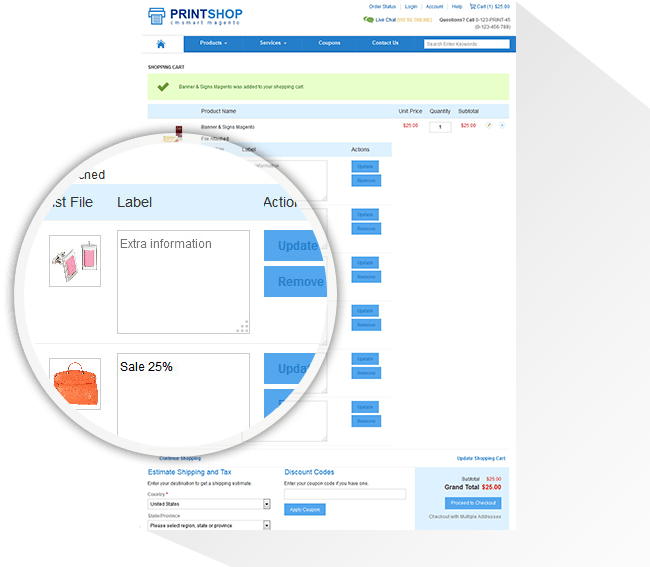 This extension is a web-to-print solution built on Magento platform. 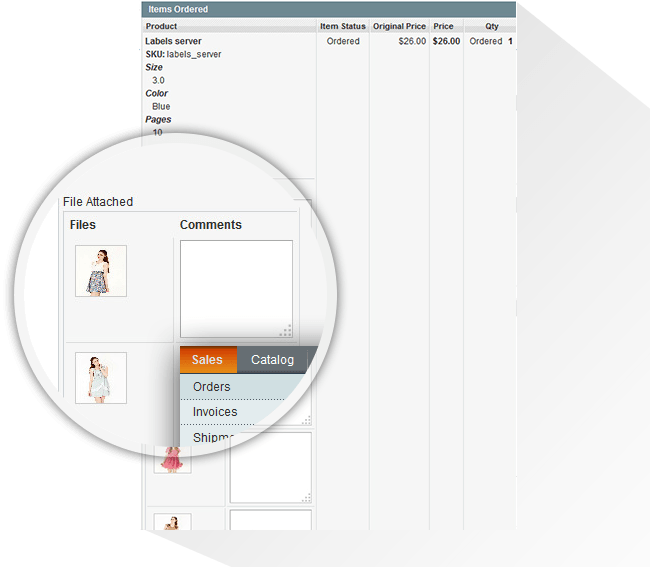 Magento order upload extension allows your customer to attach any files, images into each product on the product details page. Let customers see and edit the fields and upload files. 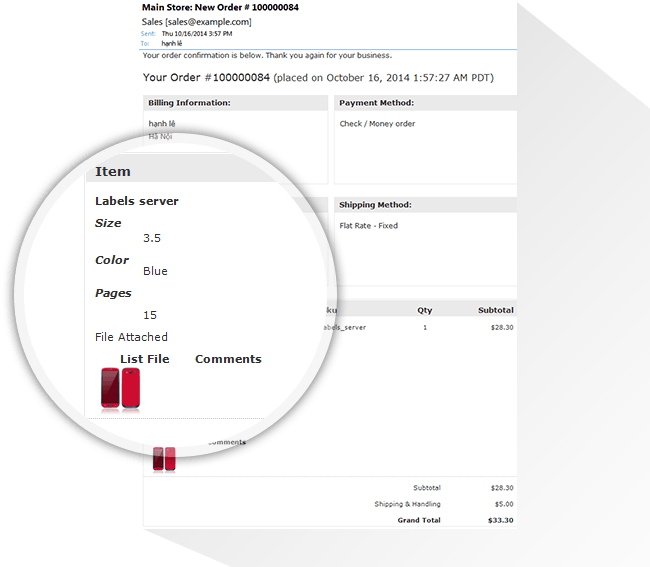 Store owners or customers can see the files at per order, confirmation email and can download them with zipping. Step 2: Click on the button "Upload Now": It will display an "Upload Files" popup. You click on button "Browse Files" to choose files from local computer and then, you click on button "Upload Files. You can add the label for the file; remove the file in during upload process. Step 3: Add product to cart and implement checkout process. Step 2.Integrate "Order Upload" for each product: You click on Catalog -> Manage Products -> select product you want to integrate "Order Upload". In "edit product", you select "Yes" for Order Upload field in the General tab. Remember to save after each change. Step 3.Configure extension: In admin panel, you click on System -> Configuration -> Order Upload and setting something here. Remember to Save Configure after each change. Support multiple files types: Shoppers can upload almost any file types like jpg, jpeg, png, txt, doc, Docx, Xls, Xlsx…. 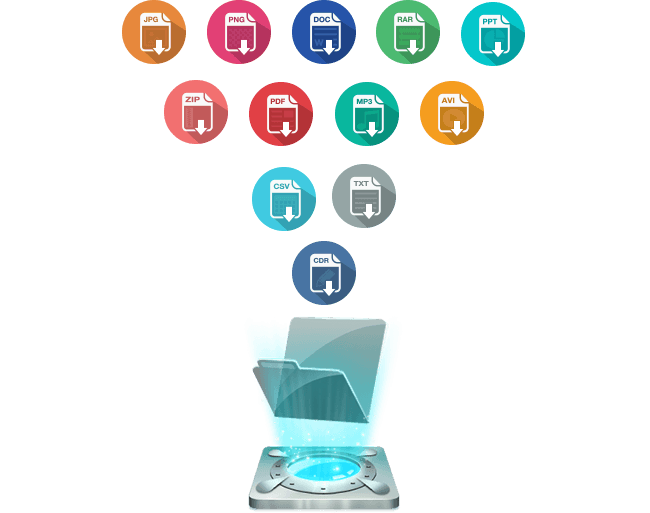 Upload multiple files at the same time: Upload multiple files at the same time using Ajax, and do not need to refresh the pages. 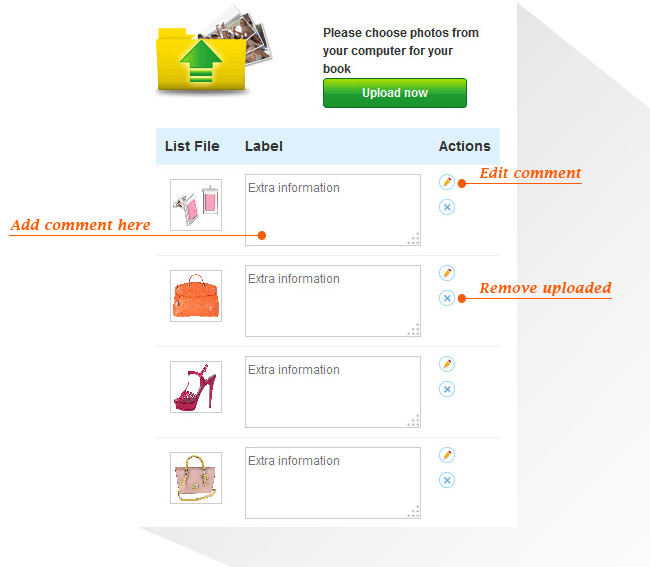 Delete/cancel files during upload Process: Through upload process shoppers can DELETE any files uploaded with just one click. They can add comments into the standard Magento order comment. After upload complete images files will be automatically thumbnails created. Besides, shoppers do not have to log in to upload files. Works for all types of product: Magento Color Swatch Extension works well with all products as simple, configurable, downloadable, and virtual products. Display uploaded files on the checkout page: After uploading files/ images, shoppers can add this product to their cart. So a shopper can upload different files/ images into different products and add all into the cart and check out the same times. Uploaded file will display on the shopping cart page, into the Magento order of client account. Used as a custom Magento product field: Use as a custom Magento product filed, so you can allow which products are uploaded or not. Files are managed inside Order Management admin panel: Upload images/ files are managed inside Order Management admin panel, and you will know which uploaded files/images belong to which products inside the same orders/ same buyers. Store owners can download the files from each order management. Configure file types: Administrators can configure which file types are allowed to upload in the module settings. Set the width and height of the flash upload window: Can set the width and height of the upload window. We got great support from cmsmart. Several issues were fixed in a couple of days with quick response times. I can recommend them. This extension was very easy to install and set up. I did it in just a few minutes. It also has a very nice interface for the customer, much better that some of the other file upload extensions out there. The extension is extremely important for my store. It brings the convenience for my customers and me. Thanks to the support that fixed all of the problems in a couple of days. I've already tried several similar products, including free ones and your plugin is the best. No more endless process to image uploading. A few minutes and everything is done. people who dare to try the new things will always achieve a reward and that reward is this extension. Give you five stars! quick and solid service, although i did have to ask for the solution after the issue had been resolved thank you for the good support. Fantastic products, Amazing customer service, thank you so much. 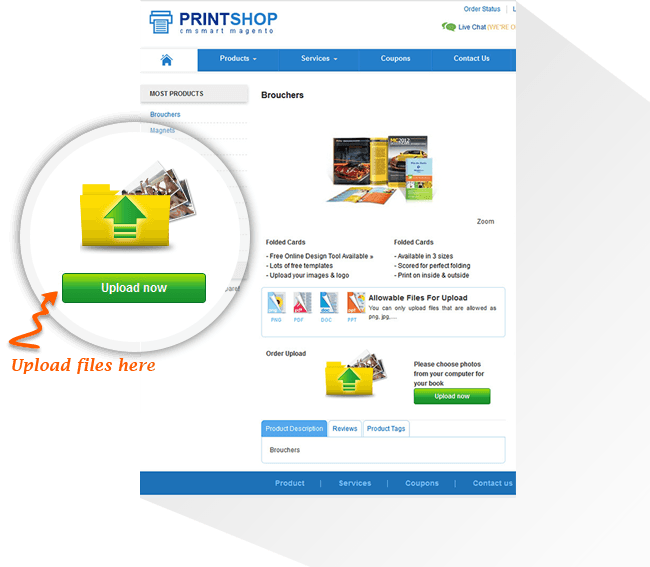 This extension helps a lot in our printing website in uploading a customers design to the page when they select the product that they want. Helps for us to to analyze whats the customers want in their design and a products. Thanks CMSmart developers team, specially to Victor and Evan. Many praise for the support. Victor has installed the extension for me and translated the text of the buttons for me in Dutch. Unfortunately, there were too many conflicts with other extensions. That's why I asked for the extension to be uninstalled again. And this did Victor very quickly. Vincent also quickly switched to my requests. Thanks many times Guys. I couldn't imagine having an online print store without this extension! It makes like so much easier when you don't have to track a customer down for artwork. They upload it, you receive it, and you're done. No emails, no phone calls, just the artwork and you're all set. This helped reduce my labor hours by huge margins, and that's great when you're running a business! Great support too! Absolutely 5 stars, just click. They are a very professional team. I had some problems, but all the time they were patient and always with the best disposition to help me solve my inconveniences. I highly recommend them. I'm not good at information technology, so I had some problems when installing but your support team worked actually enthusiastically. I really appreciate it! Now, my shop has run smoothly and earned more benefit with your product! Awesome! Your extension is exactly what I am looking for. Everything is all easy-to-use, support team is so nice! I like it very much, give your 5 stars! 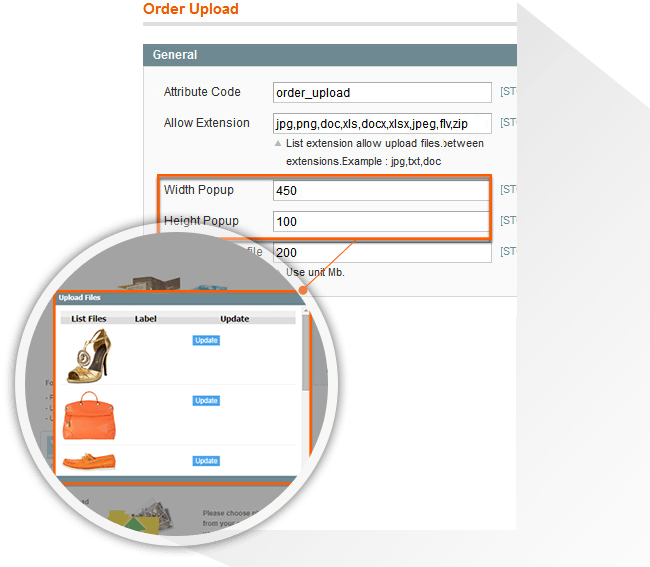 Working with Magento Order Upload Extension is one great extension, great support. There were some problems at first but it had be solved and i'm very happy. Good job. The Magento Order Upload Extension seems pretty good. We bought the order upload extension and it worked good, but had some minor issues with our template. Support fixed the very quickly for us. We can recommend it to everyone! The extension not work because of a conflict with another module, but the excellent customer service help me to quickly fix the extension. The Magento Order Upload extension did not work for bundle product on my installation, but cmsmart fixed it and not it's working very well. Thanks for all your support and teamwork. printshop theme is very good and ready to use site with very good extensions. we like the most your order upload facility. thanks. Great thank to developers support. The extension is working very well now due to your help. This extension is fully featured for the price. It's also easy to install and set up. Good job! Initially had some issues and the extension conflicted with the functionality of my site but the support team was great. They fixed all the issues and works great now. Satisfied with this extension. It save me a lots of work and my customers like it. Thank you and keep up the good work! The feature allow to upload multiple files at the same time makes me satisfied most. On the whole it is friendly and easy to customize. Well done! With Magento Order Upload Extension, I can upload many type file at the same time. Besides, I do not have to login to upload files and I will share to everyone. good products. i'm using it. ago, i had a problem when i want to attach file with products. but now, i complete easily to do that. i'm satisfied with product of CMSmart and i come back to buy another products for my website! This is extension I am looking forward. Before, I have a trouble with my site. I heard this product - Magento Order Upload Extension by chance. So I have used it and satisfied. Thanks so much! This extension helps us improve customer service and sales, pull close distance and increase revenue. I am happy with this template, recommend using it. After the installation has had a small problem with my site, your support team has resolved within 24 hours, quickly and enthusiastically. I am satisfied with the product, happy with customer care services of CmsMart, everything was wonderful. Yes, you can upload multiple images and files at the same time. And you can easily edit or remove any images and files during upload process. Besides, you can cancel this service whenever you want. Our extension supports the fixed size is 2x2 cm so all the uploaded file will be resized to 2x2. Customers can manage their uploaded file (add/edit comment, delete) on their profile page. How does admin can manage the customer’s uploaded file? Upload images/ files are managed inside Order Management admin panel, and you will know which uploaded files/images belong to which products inside the same orders/ same buyers. Store owners can download the files from each order management. Before I proceed could you please just confirm that the order upload extension is compatible with Apple products…tablets, iPhone’s etc ? Yes, our product is compatible with all devices and browsers so don’t worry about that. Will this extension work if the shopper does not have Flash installed on their browser? I'm looking for something like this, but it has to work without Flash. Yes, This extension work fine when the shopper does not have Flash installed on their browser. I need to allow clients to upload InDesign, Photoshop, Illustrator and Adobe Acrobat files. Is this possible? We have the extension "Dependent Custom Options" and need file upload for customers in the product page. Key card available in the shop? Does the extension "Order Upload Extension" work with "Dependent Custom Options"? This question is important for the purchase. You are in the printing business and have a lot of customers by introducing available products on your site where customer choose satisfied items. 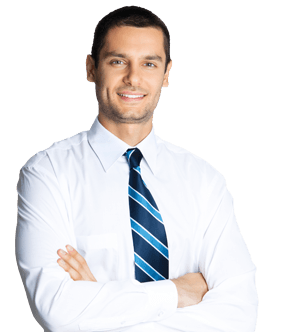 However, you are missing a huge of customers who want to print personal products which show their character as well as aspirations for a beloved person. 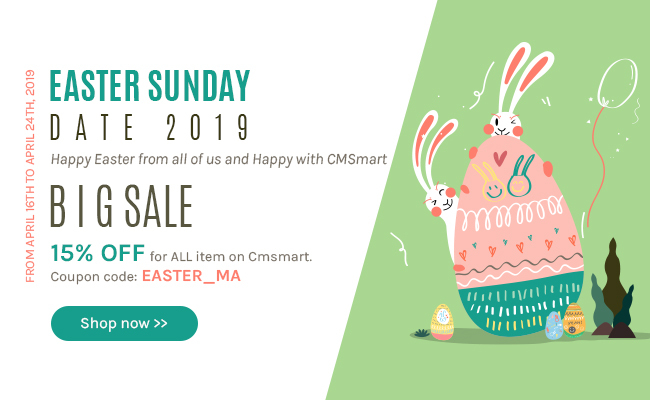 There is a product supporting this task is Magento Order Upload extension – one of the function is indispensable for your printing shop online, it is available on Cmsmart marketplace. Magento Order Upload Extension is one part in printing solution combination with the user - friendly interface which is the factor very important in E-commerce website. The harmonious combination layout will make customers comfortable when visiting your website. Besides, technology is increasing daily which demand your website must be useful for customers, especially time because they always save time as much as possible. To adapt this requirement, Magento order upload extension has highly adaptive with all Magento 1 version and many devices. Your customers can upload their file by mobile as a useful and convenient device. The buyers only need one device that accessed the internet, that all for requesting an order. We beg that this product will bring satisfaction for your buyers. After customers choose the product they want, they can choose other materials such as size, color, quantity,… so easily to see where they can upload the file they want. The uploading file is very simple with a pop-up window, it shows immediately without reloading as well as opening a new page. In the latest version, Magento Order Upload Extension comes with the variety of benefits, in which uploading multiple files at the same time is the most useful for whatever printing shop when the number of prints is too large. With this feature, your buyers will save the time of waiting and not need to refresh the pages when uploading. To integrate this function, we have used Ajax technology to make sure that your website will run smoothly and quickly. Moreover, the shop owner can set up Magento Order Upload Extension on the checkout page. At here, the buyer can upload different files and add them to cart and check out at the same times. Buyers manage uploaded files easily through selecting options with a simple manipulation. 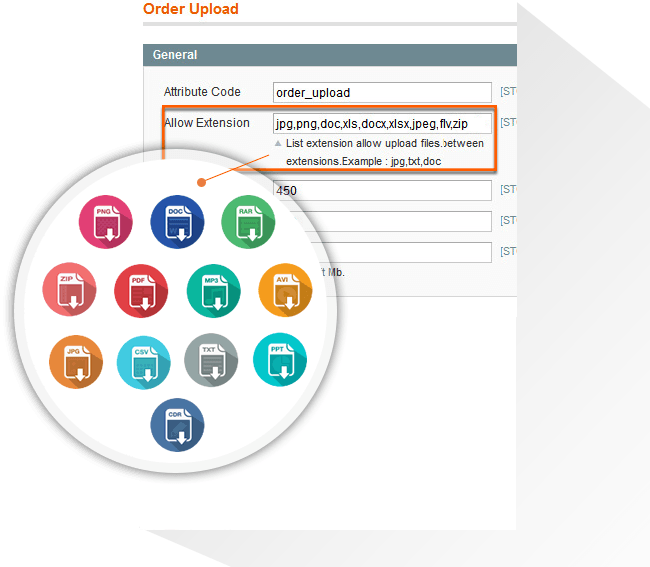 With Magento Order Upload Extension, it supports multiple file types like doc, docs, xls, xlsx, jpg, jpeg, png, txt,...customers just need to upload their file. The buyer can make the description about the product they want or design template themselves after uploading images. Just by a single click and few seconds of waiting, the customers will be totally satisfied with product returned. 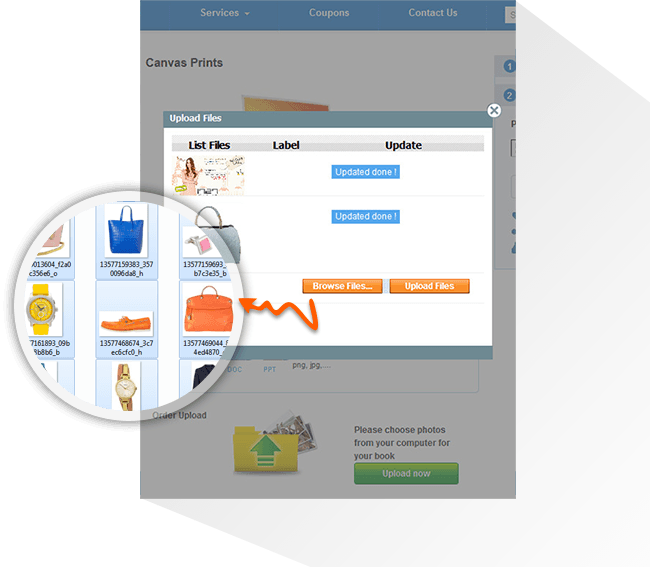 Overall, Magento Order Upload Extension is useful for your printing shop, which brings more selection for customers order products without doing any hacks to your core Magento files. Is this extension portable with porto theme ? I would like to buy this extension, but I need to check minimum width and height (in pixel) for uploaded images. Do you provide this functionality? I test you extension on your demo site and I found that didn't work as I aspect: for example I choose item "labels", upload an image and put in the cart, then I choose same item "Labels", with different pages, put in the cart without upload any image but in the cart I saw both item with the same image uploaded! And if I remove image from one of them then is removed also for the other. 1. Our product can limit size (MB), but it don't limit size of image. 2. We just test and it is still working fine. Please check it again. Thank you for your feedback, we will check and fix it in demo asap. I also test you extension on your demo site (http://demo3.cmsmart.net/kiendt/index.php/printing/labels-server.html) and I choose item "labels", upload an image and put in the cart. Then I choose same item "Labels", with no image, put in the cart and in the cart I saw both item without image! I use magento 1.9.2.4 with Foris theme. Custom option upload file not working in this situation. But with default RWD theme work fine. Is this extension can work with magento 1.9.2.4 with Foris theme? Can be that extansions is the solution for me and solve problem with file upload? I am Janet, sorry for reply late. Please create a ticket at http://cmsmart.net/your-profile/user_list_ticket to get a professional support. And provide some information such as: admin account of your website, FTP account and your server cPanel info… and clearly explain the situation you are facing, even which a screenshot, so we can help you faster and better. does this twist the custom option upload? or is independent. Could this handle a central gallery? I mean, I want to upload some images on the backend, and every user have the option to choose those, or upload a new one. We will have to request for extra services fee to accomplish this for you. Then we can continue to support you faster. You describe the popup window as being Flash. Does that mean this is not compatible with iPads or iPhones? We have just have a Flash in Desktop, and this function is not available in Ipads and Iphones.